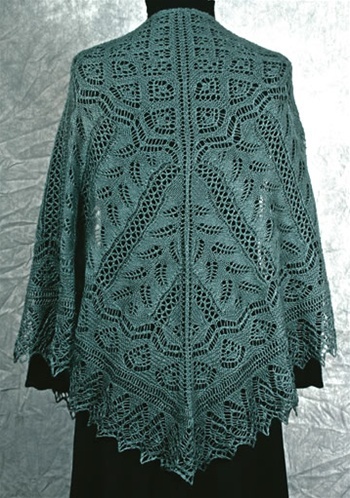 Various fern motifs from Shetland to traditional combine in the delicate Fern Glade shawl. At the top, small motifs like little fiddleheads grow to become graceful fern fronds. A traditional Snail Shell edging finishes the shawl in a fanciful nod to the snails we see on dewy ferns in the morning. The shawl is worked by casting on at the middle top, then increasing to create a triangular shape. 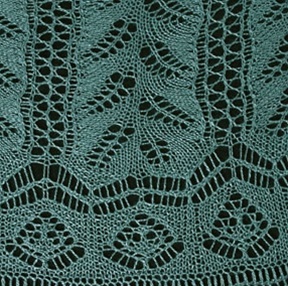 It is finished with lace edging worked sideways. Some patterns have shaping on every row. Approximately 72" across top edge, 33" down center back. Takes approximately 1100 yards lace weight yarn. For Advanced Intermediate or Experienced lace knitters. 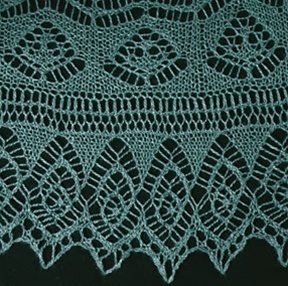 All Fiddlesticks Knitting lace patterns are charted.